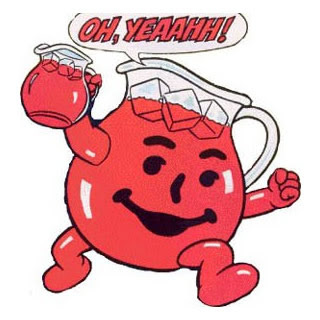 When all the wooing is done, when all the conversation is over, when all the dialogue is completed, and when all the “coolness” has been delivered, what has been masked as Kool-aid is really going to be poison to the soul of the Church. Listen carefully to the voices and take in all of the sound bites. You might even read their books or better yet go to their conferences and memorize their sermons but soon you will come to discover that someone is trying to buy the vineyard. . . . but only if you are discerning enough to not let the package confuse you. 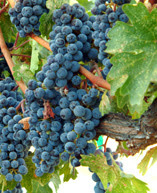 For those who refuse to sell this vineyard, it very well could be stolen from them. Naboth’s greatest legacy was that he gave his life for his heritage. Something that had been delivered to him from the previous generation was so precious that he was unwilling to part with it. Even the king’s money was not enough to dissuade him. What I really admire about Naboth is that he did not even flinch or buckle to the social pressure or political presence of Ahab. I have some heritage in me that I am unwilling to sell! One particular incident where my heritage takes me goes back twenty-seven years ago when I was 14 years old. My parents took me to my very first General Conference in Louisville, Kentucky. The first service we went to was a Harvestime broadcast recording that featured Hugh Rose who led us in “I See A Crimson Stream of Blood.” It was a very powerful shaping moment in my young life to see that many folks singing one of our solidly doctrinal songs written by G. T. Haywood. After this N. A. Urshan and C. M. Becton preached the message. It was at this conference that some young men were allowed to preach General Conference. Rex Johnson, who was our General Youth President, preached one night. The next night, another young pastor from Raleigh, North Carolina, named Wayne Huntley preached a message that I will never forget. He preached on the necessity of revival and the mandate of staying with the apostolic doctrine. About ¾’s through his message, he asked every preacher who was 35 and under that was going to continue to preach the apostolic message with passion and power to stand and wave their handkerchiefs. The building exploded with men who shook the rafters and waved a sea of white. I was sitting in the risers on the right side of the platform and was literally overwhelmed at that scene. So if you think that I shall sit back 27 years later and not let my dissenting voice be heard, you are terribly wrong. I was not a preacher back then and certainly had no idea that I would ever be one but time passed and God’s calling came and here we are! Of late (the last two years or so) many have been inundated by the siren song of the Emergents or the Emerging Church. This is particularly an alluring voice in our age of uncertainty. Because everyone has an opinion and talk shows have allowed the foolish to call in and air their grievances to the masses, suddenly “experts” have arisen from under their rocks. What they are bringing to us from under their rocks is a very convoluted view of Scripture and biblical doctrine that has been mixed with worldly philosophy and new methods. What is occurring is what one of our “top-gun” preachers in the UPCI told me less than a year ago, “Preachers these days are bored with preaching and praying.” When we turn our sights from prayer and ministry of the Word, our days of effective ministry will become very limited. I personally do not think that all of this was initially taken up with the intent to embrace the uncertainty of the Emerging Church. Many of these ideas were taken up in an effort to assist with church growth. We read their books and decided that we would take the good and toss the bad. However, we live in times where there are many seducing spirits that aren’t as easily recognizable as the outright doctrines of devils. Therein is the danger because the more familiar we become with books, techniques, and men the less familiar we become with the Book, the Apostolic method, and God. Some who are reading this blog may question, what in the world are you writing about? I haven’t the foggiest idea what the Emerging Church is and it really does not effect me. I thought the same thing about 2 years ago too but now as a few miles are starting to stack up, it almost would seem as if everywhere I look there is tiny piece of error that is working its way into the Church. I will leave a few key points about the Emergents and then post some other things in a few days that will further shed light on this new fad we are facing. The Emerging Church is afraid to say anything that appears to have any Scriptural certainty. They are not certain if there is a Hell or if the Buddhists, Hindus, and Muslims will not in the end be saved. In fact, if you read Velvet Elvis by Rob Bell, he did not take very long establishing that he was a universalist. This is a trendy and cool thought for the Emergents to embrace especially in light of their desperation to undo the possibility of hell. There is great hesitation to embrace any certainty of a strong concept of any salvation message. For those who do say with certainty that there is a specific and Scriptural mode of salvation, a doctrine of separation from the world, and a very clear-cut and defined judgment in the future, they are scoffed at. Not only are they scoffed at but they become shouted down, smirked upon with elitism, and winked at with degrading toleration as a bunch of Pharisees. This is the foxy methods of Brian Maclaren, Rob Bell, Donald Miller and a few others. Doctrinal certainty and great devotion to Scripture is not what makes one a Pharisee. Pharisees become such by the direction of their heart and spirit. 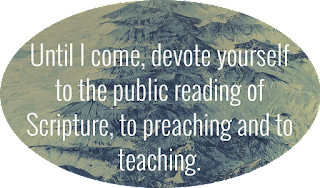 So to further stab home the point of this Pharisee characterization, a parade of harlots, misfits, and down-and-outers are passed in front of us and exalted (not literally but in the metaphorical content of “preaching”). The problem with this is that situational ethics is used to determine doctrine. Nothing could be further from the Truth. The woman in John 4 was a real winner in the eyes of society but her approach to the Christ was correct and she was led into the Kingdom. What is often forgotten by the “Pharisee hunters” is that in the chapter immediately preceding, a Pharisee (imagine that! ), was given incredible insight into salvation. Such was his devotion to the Lord that some historians believe that Nicodemus was one of those involved in removing him from the Cross. God changed both of them. He changed the woman with wrecked morals and He changed the man with the pristine pedigree. Key point being that both of them were changed! What is unnerving to the Emergent proponents is that anyone could be so certain about what Scripture has to say. So now salvation can become whatever they make it. Good morals, folks trying to do their best, or working in as much “light” as they have all become the path for salvation. The “what if’s” become the center point of theology for the Emergents. Working in tandem with this doctrinal indifference is a false sense of humility. It works like this, “I would never want to say that I could know the purpose and intent of Scripture. I would never be so judgmental to say that someone was lost (even those who are in the blackest of sin). It’s just not my call, I would rather leave it all up to God to determine who is saved and lost, blah, blah, blah. . .” When this happens the table is turned on the “Pharisee” who is certain of the New Birth message, of the great doctrines of the Bible, of the inerrancy and clarity of Scripture, and of the principles of holiness and separation. What this sense of false humility really does is undermine the Gospel and turns it into a very ambiguous and pliable something or other that has no ability to save at all. Yet this is very appealing to those who have fallen under the sway of the spirit of the age. This false sense of humility actually allows culture to rule the authority of the Gospel. It works well with those who refuse to submit to authoritative biblical truth that will correct worldly lifestyles, unholy minds, and ungodly behavior. 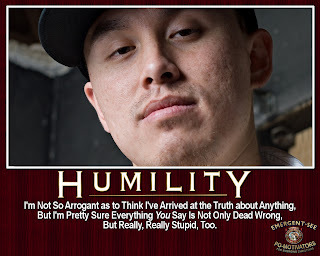 The prevailing problem this false humility presents is that what martyrs once died for has been so drastically changed that it now has no power to change lives in our generation. The cry for keeping it about Jesus rings hollowly because whatever Jesus comes into contact with, He radically changes. If you want a Crown, it will be preceded by a Cross. Somehow cross-bearing changes the way you walk, talk, and so on. . . .
You've nailed this one. In just the last couple of months, while participating in some online discussions with other Oneness Pentecostals, I have been unpleasantly surprised to find that more and more ministers would rather preach salvation, love, grace and mercy alone. In doing so, there is glaring absence of "biblical truth that will correct worldly lifestyles, unholy minds, and ungodly behavior." for fear of offending or appearing judgmental. I look forward to the continuation of your blog on this topic. Mark Driscoll has some interesting material. You are correct in that he has worked very hard to distance himself from the Emergents. My major drawback with MD is the proclivities that he has to use gutter language and sometimes profanity in the pulpit. Thanks for reading and thanks for the comments. . . Thanks for taking the time to put these thoughts on paper. Thank you for sharing this with the world. I has brought to light some things that I have been questioning myself. I look forward to more info.